The last few recipes I’ve shared here reflect my go-to easy meals. After all, skillets of meat and vegetables about sums up a given dinner in the Official Empowered Sustenance Test Kitchen. While many of my skillet dinners are not particularly photogenic, this was. After the first bite, I quickly deemed it blog worthy. Pancetta – You’ll usually find pancetta, an Italian dry-cured pork belly, in well-stocked grocery stores with the charcuterie and cheeses. Coconut Secret Garlic Sauce – from the makers of coconut aminos, the ultimate soy-free alternative to soy sauce, comes their Garlic Sauce. It tastes like a salty-sweet umami flavor bomb with a kick of garlic. It’s faster than using minced garlic and works beautifully with the red peppers. Feel free to substitute plain coconut aminos and a pinch of garlic powder. The garlic sauce is available here or at most health food stores. Spaghetti squash – Boycott mushy spaghetti squash! Read my post, How to Perfectly Cook Spaghetti Squash to learn the unusual method for getting perfect “al dente” spaghetti squash every time. 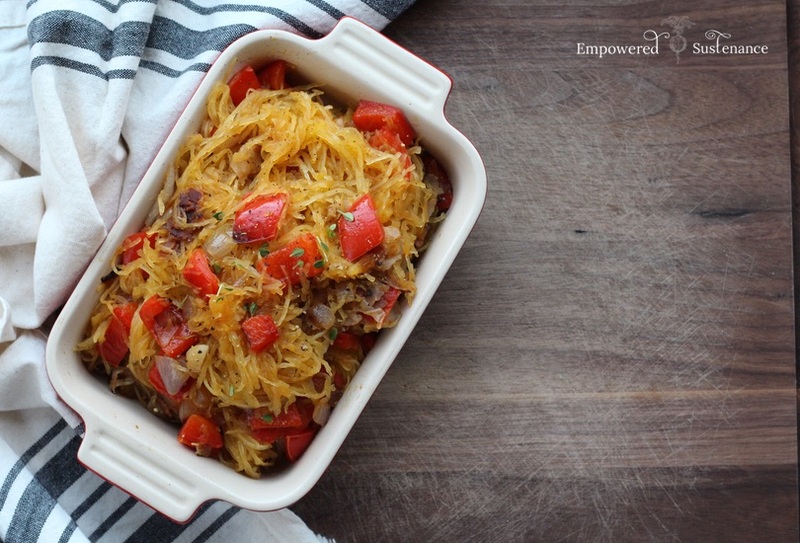 With only five ingredients, this easy paleo spaghetti squash skillet packs a punch of flavor. In a large skillet over medium heat, begin to cook the pancetta. Once the fat has rendered, add the bell pepper and shallots. Cover partially and cook, stirring occasionally, until the vegetables have softened and the shallot is translucent. Uncover and raise the heat slightly. Cook briefly to add some golden brown color to the veggies. Add the garlic sauce and spaghetti squash. Stir and cook for a couple of minutes to meld the flavors, then serve. I would like to print out some of your recipes. How can I get the picture and writing smaller so that it will fit on a regular page? 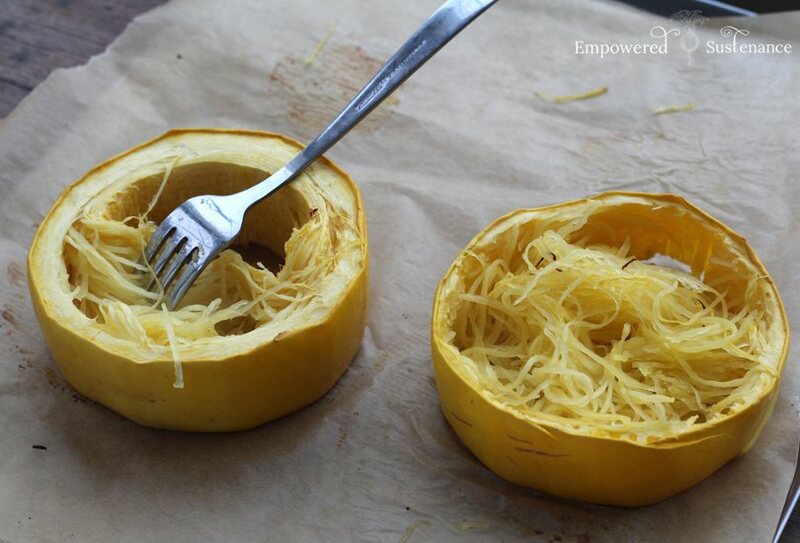 Oh I wish we could get spaghetti squash in Scotland as they seem so versatile:) This looks fab though. 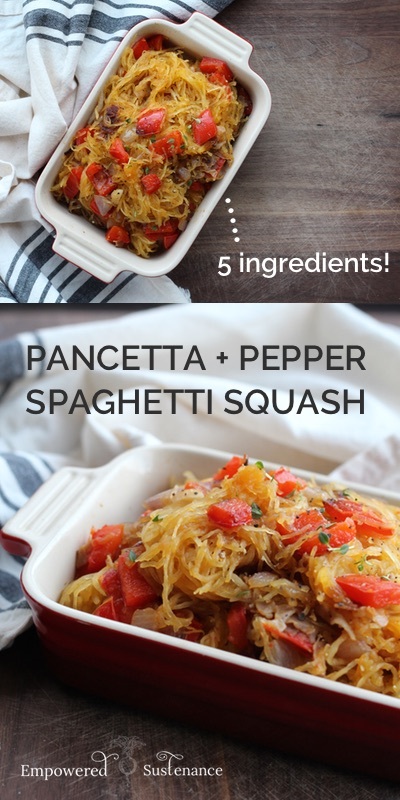 Spaghetti squash is a favorite of mine and I will definitely be trying this combination! Also, your comment about most skillet meals not being very photogenic made me laugh…I say the same thing!